excellent HR!! please scratch a setlist as we all love the archiving of it all. AND ENJOY THE NIGHT! Here's hoping the last night is really memorable for you, Dave! Thanks, Dave. The setlist submitted to the wiki site adds "Moods for Moderns" and "This House Is Empty Now." But he performed almost all of “Imperial Bedroom,” while occasionally joking about the record’s relative lack of commercial success. He even did the rarely performed “Boy with a Problem,” using a lyric sheet to get the words right. The show got off to a bit of a rocky start. I thought the sound was muddy and Costello occasionally had some difficulty finding the melodic line. “Accidents Will Happen” sounded oddly out of sync. The show got better as it progressed, with a long version of “Watching The Detectives” that saw Costello and his band illuminated by dim green lights while the screen behind the stage flashed posters from cheesy detective movies. The ending may have been predictable, but satisfying nonetheless. First came a long version of “Every Day I Write the Book” that had the audience up and dancing in the aisles, followed by “Pump It Up” and the big forward surge of ”(What’s So Funny ’Bout) Peace, Love and Understanding? Last edited by sweetest punch on Wed Jul 26, 2017 3:14 pm, edited 1 time in total. And No Coffee Table wrote: Thanks, Dave. The setlist submitted to the wiki site adds "Moods for Moderns" and "This House Is Empty Now." Yep, that's absolutely correct. Forgot those two! is it a tour closer with that alleged IB&OC date coming in September??? 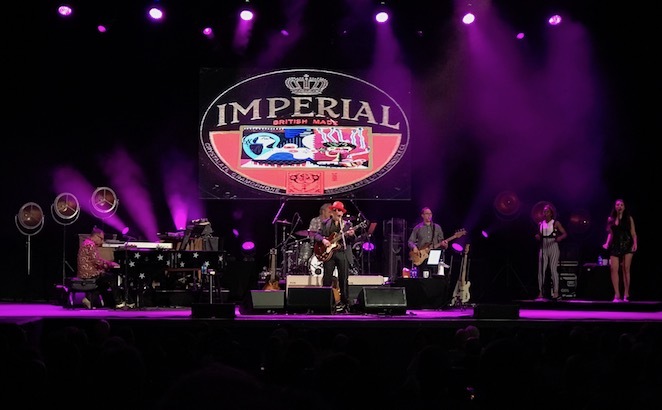 Elvis Costello & The Imposters brought The “Imperial Bedroom & Other Chambers” Tour to The Providence Performing Arts Center last night. Costello and his band The Imposters, including original Attractions members Pete Thomas on Drums and Steve Nieve on keyboards, along with the accomplished Davey Faragher on bass, was backed by the beautiful harmonic vocals provided by the talented duo of Kitten Kuroi and Brianna Lee. The band performed several songs from Costello’s 1982 album Imperial Bedroom. Hailed in a review by Rolling Stone as “his masterpiece”, the album was somewhat under-appreciated by the masses A few of the songs played from its track list included “Tears Before Bedtime”, “The Long Honeymoon”, “You Little Fool”, and “Pidgin English”. Of course no Elvis Costello show would be complete without stalwarts of his vast catalog such as “(The Angels Wanna Wear My) Red Shoes”, “Accidents Will Happen”, “Watching The Detectives”, “Green Shirt”, among many others. The band played much more intensely than the quartet it was comprised of, delivering a broad selection of tunes ranging from Costello’s distinctive early angry young Brit sound to a more soothing set of love ballads. Costello and mates finished a solid 2 hour and 15 minute set with a loaded encore of “Alison”, “Every Day I Write The Book”, “Pump It Up”, and “(What’s So Funny ‘bout) Peace, Love and Understanding” to name a few of the extensive encore. The ever beautiful venue that is PPAC, continues to draw big name acts and large audiences as it has forged itself as a bonafide concert venue in the greater Rhode Island area to catch a great show. GoLocalProv was there to seize this epic event for Elvis Costello fans. 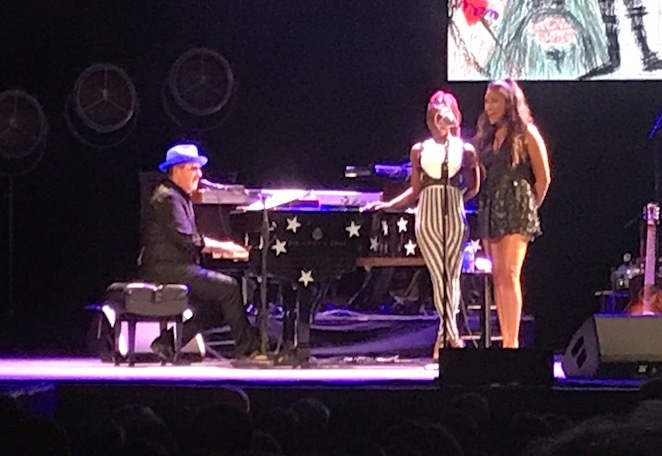 Elvis Costello ended his “Imperial Bedroom and Other Chambers” Tour with a marathon 32 song, 2 and a half hour set at the Providence Performing Arts Center on Tuesday night. The tour, based around the 1982 “Imperial Bedroom” album, also featured material from throughout Costello’s career; almost everything from his 1977 debut My Aim Is True, to his work with Burt Bacharach in the late 90’s, to unreleased tracks from his planned musical “A Face in the Crowd” was represented. Costello’s backing band, The Imposters, consists of Steve Nieve on keyboards and Pete Thomas on drums from the Attractions, as well as bass player Davey Faragher, who also contributed backing vocals along with Kitten Kuroi and Briana Lee. The show opened with “The Loved Ones” from Imperial Bedroom, and there were sound challenges early in the set with a somewhat murky mix that was slowly corrected as the evening progressed. Providence was one of the only shows of the tour in which the entire Imperial Bedroom album was performed, although not in order. Powerhouse keyboardist Steve Nieve was impressive as he (literally) hopped between grand piano, Vox organ, Hammond organ, and other various keyboards, sometimes mid-song. Thomas and Faragher provided a solid rhythm section throughout, while Kuroi and Lee, at times slightly overused, provided strong vocals, particularly on the more lush “Imperial Bedroom” and later period tracks. Highlights included an extended take on “Watching the Detectives” and “The Long Honeymoon,” which Costello described as somewhat of a sequel to the “Detectives,” featuring the same characters five years later. The show wrapped with an extended “Everyday I Write The Book,” during which many in the crowd moved down to the front of the stage and each band member took a turn in the solo spotlight, followed by a muddy “Pump it Up” and the strong closer “(What’s So Funny ‘Bout) Peace Love and Understanding,” to rapturous applause from the nearly sold out crowd. Costello’s vocals remained strong throughout the long performance. It will certainly be interesting to see what his next move is, after a successful tour based on a 34 year old album that didn’t sell well to begin with. Hopefully he continues to work on the “Face in the Crowd” concept, as it was among the strongest material of the evening. Seems like it will be an Imposters show as that is how the show has been advertised, and the fact that Kitten has indicated she will performing, I have to think it will be an IB show as well. Not sure how I feel about this upcoming performance. I saw the Imperial Bedroom tour in Boston last fall (when I was visiting my kids who are in college up there). Since the Beaver Creek show is near my home in Denver, I have tickets to this one, of course. It's been awhile since I saw an Imposters show, so I'm up for a general type of setlist. Even better, how about a 40th Anniversary MAIT show ? Funny, but I never found Kitten or Brianna "overused." Actually, I think they keep the band on their toes, and have told them both that. I know....I wanted him to open the show with it.